Hi Friends: Here's another card using images from SheepSki Designs. I loved the shoe and wanted to use it with the party glass! Not sure what kind of drink it is, but it was fun to color to match the papers I wanted to use! I'm ready for some fun - how about you? (All of us here in OH are enjoying this 70 degree weather! I'm thinking a night out on a nice patio sounds great!) Have a great weekend! Print image onto smooth white cardstock and color with Spectrum Noir Markers, Glitter Brush Pens, and Zig Brush pens (black fine lines). 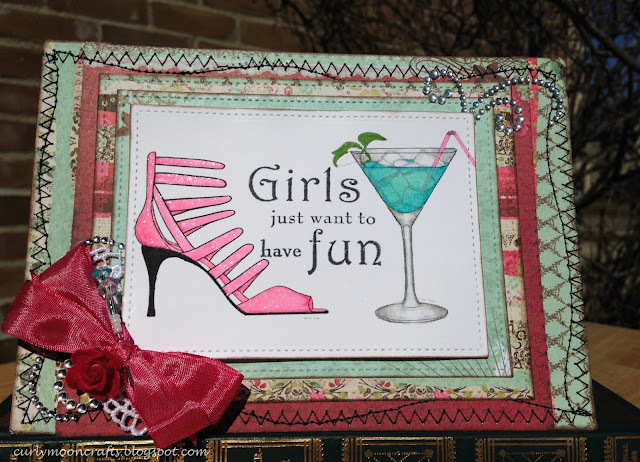 Die cut the image with the stitched rectangles die and stamp the sentiment in the center. For background, cut panels from the paper pack to fit an A7 card base and die cut the center panels with the stitched rectangles die. Machine stitch a border on the base panel and add to card. Ink all edges and adhere panels to card base. Add the image panel to the center with foam squares. Add self-adhesive gem flourishes to the corners. Color a piece of Crinkle Ribbon and a small flower with the CR5 marker and tie the ribbon in a double bow. Add some lace, the bow, and flower to the corner. Finish with a stick pen enhanced with seed beads colored with the SN markers used on the shoes and drink.